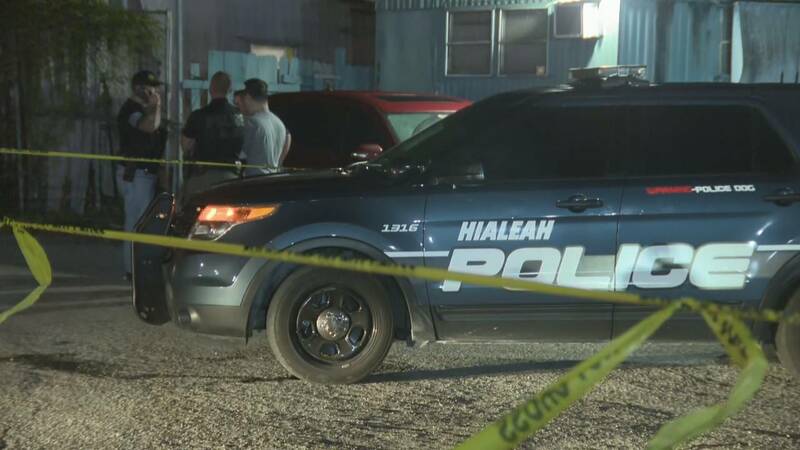 MIAMI-DADE COUNTY, Fla. - Hialeah police are investigating an officer-involved shooting that wounded two armed robbery suspects early Friday in northwest Miami-Dade County. The police-involved shooting occurred shortly after 2 a.m. near Northwest 29th Court and Northwest 76th Street. Hialeah police Lt. Eddie Rodriguez said the suspects opened fire at officers, who exchanged gunfire. "Shots back to back to back," Adelen Ramos, who was awakened by the gunfire, said. The suspects, who were wanted for numerous armed robberies, were taken to Jackson Memorial Hospital's Ryder Trauma Center in Miami. Their conditions were not immediately known, but Rodriguez said they survived. Hialeah police investigate an officer-involved shooting that wounded two armed robbery suspects. A view from Sky 10 showed two cars with bullet holes in the windows and exteriors. No officers were wounded in the shootout. "It's very concerning. These cops are putting their lives on the line everyday for us," Ramos said. Miami-Dade police were also at the scene.